It was interesting to see different creative groups moving in opposite directions…people leaving their full-time job to go fully dedicated on comics stuff, while others reducing their time on comics to get a full-time job in Vancouver… yeah, I get it… this is not a cheap city to live in and making a living out of comics alone can be a really bumpy ride. Now I continue writing and producing my next comic entitled Family Ties and having the next VanCAF as a milestone to comeback with something new and fresh every year. 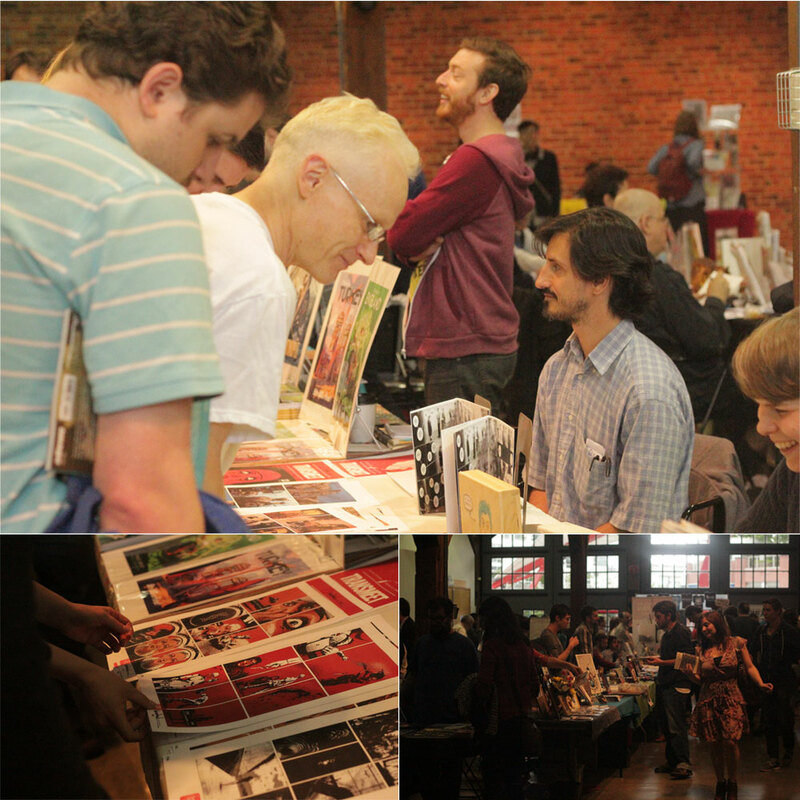 The 2017 edition of VANCAF has come and gone away, and as always the event was another opportunity to meet new people, see great artists, and check new exciting work. I had the chance to meet in person for the first time the very talented Johnnie Christmas, Farel Dalrymple and Aaron Manczyk. And now, it’s time to focus on my next comic entitled Jupiter’s Effect… so, stay tuned! 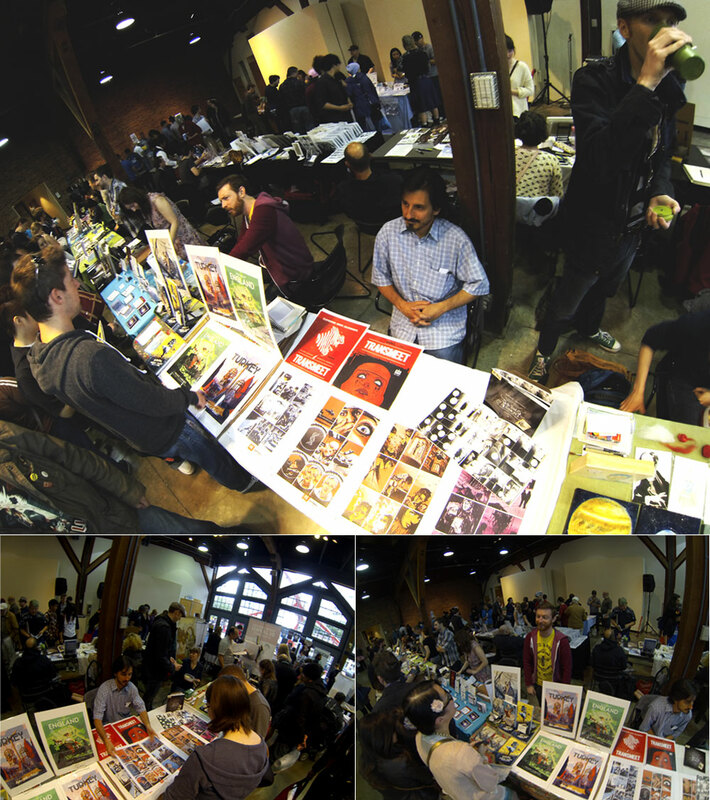 Another great edition of Vancouver Comic Arts Festival took place in May and this time I must say, had the most complete set of work, selling five different titles: Transmeet, Savings Account and my first three stories for the Binary Noise series. In this edition, my table was right in the middle of two amazing comic book artists/writers: Kurtis Wiebe and Colin Lorimer. Another VANCAF has come and gone. The 2015 edition had for the first time two halls and 250 exhibitors, so basically from one year to another the event has doubled the size! In the beginning I was a bit concerned about that… having more artists and more offers for sale, that would dilute any potential sales of my comics, and my work would get lost in that immense sea of tables and artists. But I’m glad to say that I was wrong, dead wrong… The event has got much bigger and with that attracted a multitude of new people to both halls. I had so many people around my table, chatting, learning more about my work and buying! 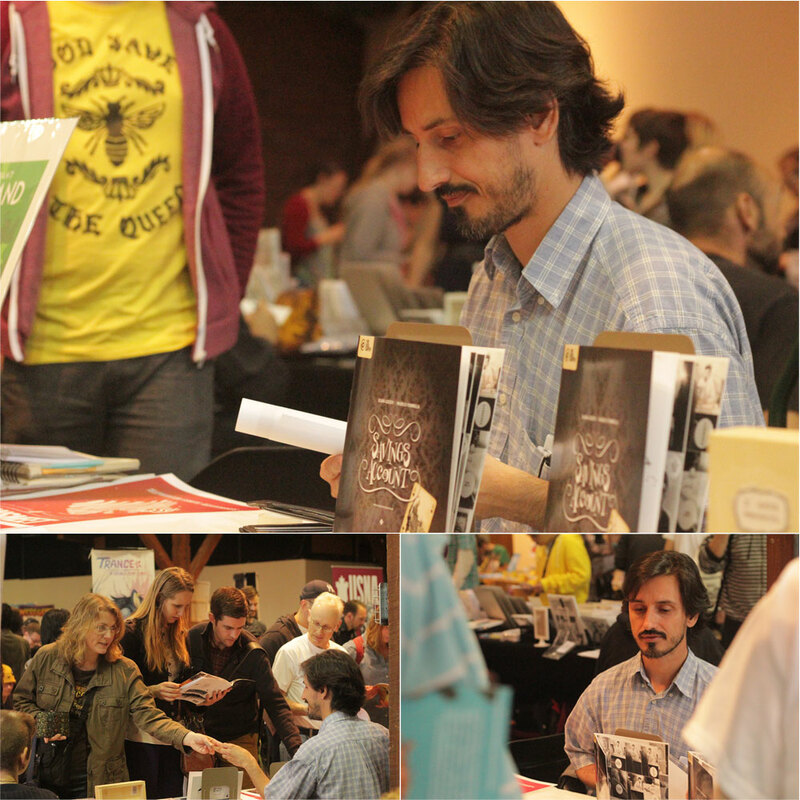 This is a weekend event and by Sunday morning I had almost sold out all my copies! What an incredible and pleasant surprise it was! Now I’m full steam ahead, working on Distant Argos my new story and I hope to have it done for next year’s edition of VANCAF! I didn’t have much time to talk about my participation at this edition of the event but above you have a snapshot of my table. It was nice to see my space getting busier with more titles, providing a more robust body of work. The iPad looping a TRANSMEET Trailer was also a nice addition dragging a lot of attention to the table. I had the privilege to meet Amancay Nahuelpan who was sitting by my side exposing an absolutely amazing work. You should check it out! As always, the event was super well organized by Shannon Campbell and I can’t thank her and all the volunteers enough for providing such a great time at the Vancouver Round House. Vancouver Comic Arts Festival 2013 was my very first comic conference ever! And what a great surprise it was! The event was packed for two days with great talents from Vancouver, Victoria, Toronto, Seattle, Portland, Los Angeles, New York and Massachusetts. I had the privilege to have beside me the amazing Tony Cliff promoting his work on Delilah Dirk and on my other side the super talented Sydney More with her stellar art work. The event masterfully organized by Shannon Campbell had an excellent team of volunteers, always ready to provide any necessary assistance to special guests and exhibitors, also the event was packed with cool lectures during the two days. I guess for me the most interesting thing during the festival was the opportunity to have a closer contact with the public, understanding people’s reactions to my art, and how well received it was. That definitely gave me an extra energy boost to continue making comics. In the panel above you can see Jesse Davidge, Mei K, Tony Cliff and I promoting our projects. If you are still interested, you can get copies of Transmeet and Savings Account (co-created with Juliana Azevedo) by clicking on the respective links. Well, that’s it for now… back to the drawing board where new possibilities await! Photos taken by my brother Luciano Pommella.